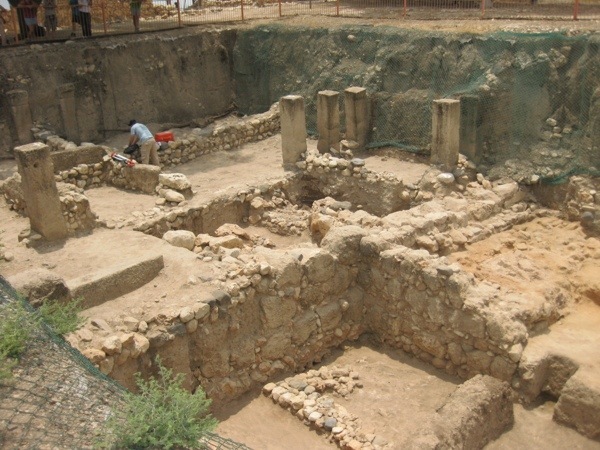 Today was the first day of the 2012 dig season at Tel Hazor. As is normally the case, the first day of an excavation is somewhat different from each day that will follow. First of all, the site must be prepared properly: all of the dust, leafy matter and “winter wash” that covered the previous season’s progress must be cleared away and deposited elsewhere. 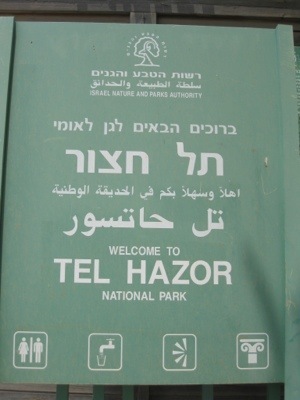 I found this sign not out in front of the entry way to Hazor, but leaning up against the side of a shed. Anyway, welcome to Hazor! Thus, after carrying tools out of giant tool coffins, our job for the day was to sweep up leaves, dust, and other nonsense in order to make the site look as presentable as possible. We accomplished this using hand brooms, dust pans (which were actually the end pieces of flat metal shovels), and plastic buckets. Tomorrow, a photography balloon will be set out above the site to take high quality pictures for the purpose of cataloging the season’s significant finds. 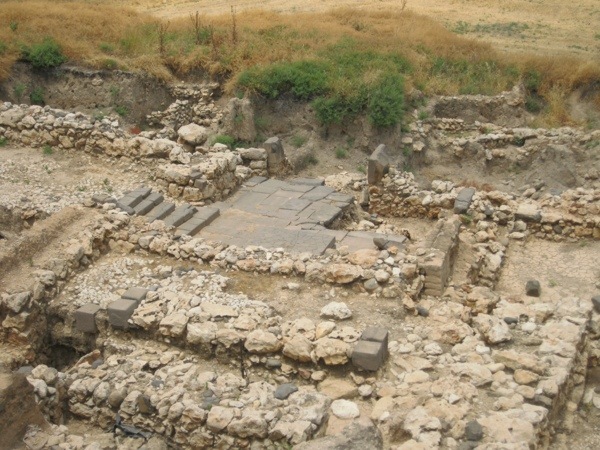 The specific site at Tel Hazor that the team will dig is known as Area M, which includes a gate connecting the Upper and Lower Cities. (The gateway is visible in the photos below if you know what you’re looking for; if not, look for the darker stones that serve as a floor.) Area M is a mishmash of both early (Canaanite) and late (apparently Israelite) structures in the different strata, so part of our struggle during the season will be to try to understand the puzzle that is laid out before us, and how the area might have looked in a given century. This photo includes the gateway to the upper city. Area M all cleaned up, almost ready for the photo balloons. Because the dig directors didn’t especially care for anything we found in today’s cleaning, nearly every fragment of pottery, animal bones, rocks, etc. was destined for dumping. Instead of letting this happen, I managed to scoop up and rescue some of the more interesting pieces for show-and-tell purposes back home. 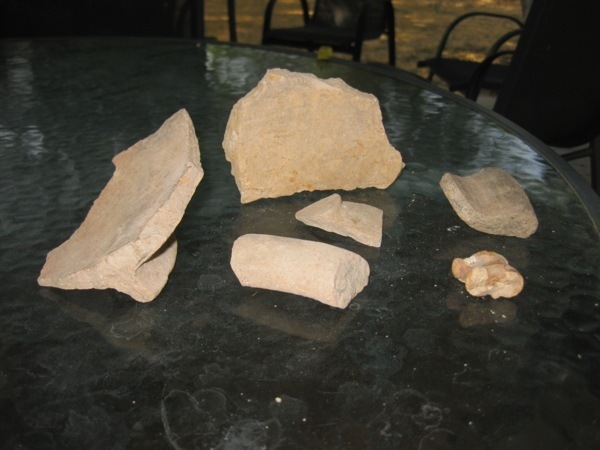 Left: piece of what likely was a large jar, including part of its base. Back: a quite thick piece of a pot. Center: small piece of a jar, including part of its base. Front: broken piece of a jar’s handle. Right Mid: piece of another thick jar, including part of its lip. Right Front: knuckle bone of a sheep or goat. The work today was hard: I can already tell that I’ll be pretty sore (this seems to be the sentiment throughout the camp). Waking up at 4:00 am was surprisingly easy today, but I am sure the story will be different after a few days. The weather was bearable: from 5 until about 9 or 10, it was no worse than a sweltering St. Louis summer day. After that, the heat reached a new level, and I have heard that the weather will soon get hotter. All in all, though, it was a fulfilling first day, and the excitement at what we may find in the days and weeks to come is becoming palpable. Here’s to our digging! Hi Rob, I am glad to hear that you made it. Sounds like you had some interesting travel experiences. I look forward to hearing about your digs. Take care.